For my own memories, and with my lack of vanity, I wanted to publish a photo of my largest point of pregnancy: The day before labour started. At the time, I didn't feel that large, but now... OMFG. That's a LOT of baby there in that photo. I remember having my midwife check up that morning, and during her visit I had a contraction that was different to the (Toni) Braxton Hicks types. As we were given 4 due dates during the year, Baby Darling ended up being born on one of them! i love this photo!!! and i've been meaning to comment on your gorgeous new darling, congratulations! You look so good! Congratulations!! I love looking at photos from when I was pregnant. It seems so long ago! I felt huge at the time but looking at photos I was even bigger than I realised. It's crazy! It seems like a lifetime ago. I love how real your photo is. You look tired and your ankles are swollen. 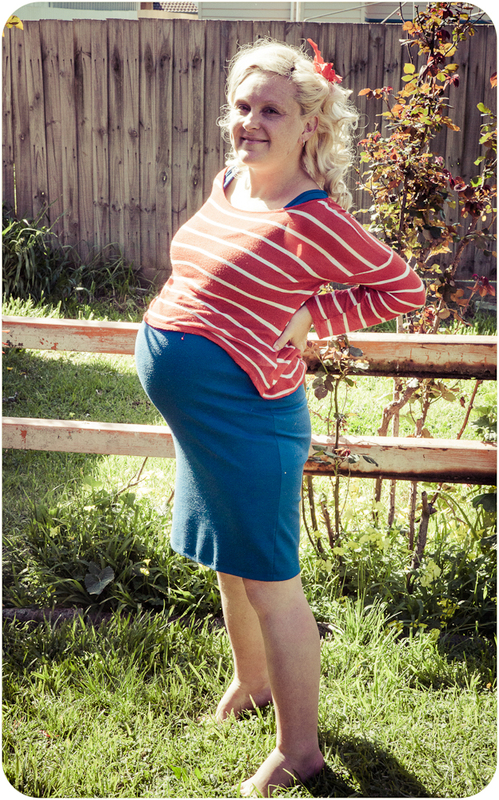 I am 33 weeks pregnant, with our first too,and I want to be at the point you are at with a darling baby! Congratulations! Loving the "real-ness" of this photo, V. Of course you look a bit tired and swollen, but you're still smiling : ) It's almost as if baby Darling is in there saying "look out world, here I come!"